Whisk in dry ingredients then add melted butter. Add milk and orange peel then strain. 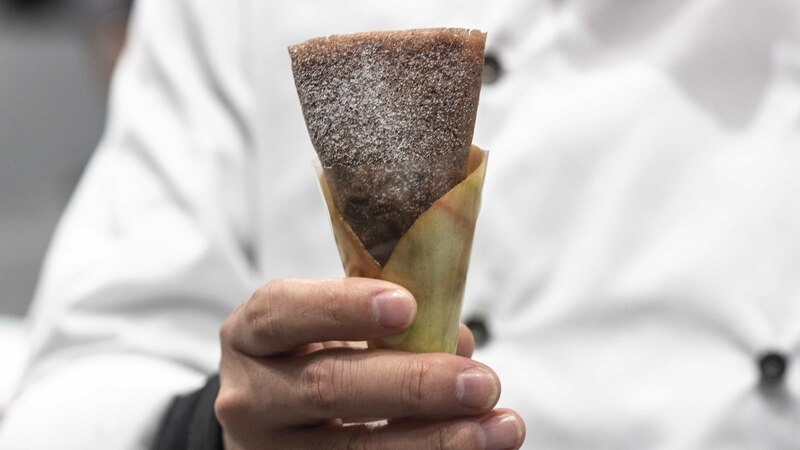 Bake at 170° C during 7 minutes then make a flat ice cream cone shape. Boil all the ingredients then let them rest. Mix 100 grams light cream, sugar and invert sugar. Add tea leaves then simmer for 3 min. Strain and add 20 gr of cream then make a ganache. Fold jam, cream, ganache and nuts with crepe. Place the crepe into rolled cookie then cover with agar film bag.